I've got to say, for all that I love Colossus: The Forbin Project, I have to wonder how it ever got made. It's rather... procedural. When I was growing up, and one of two kids in my entire school learning about computers myself by staying after school and working on the teletype machine connected to the district's HP9000 timeshare mainframe, scenes of magnetic tapes spinning and words being spelled out in 12x9 lights was awesome... But how the hell did anyone think this would draw in the crowds? In hindsight, though, it plays out a little like "Telefon" or "The Day of the Jackal"; there's no denying the suspense builds and builds, and there is simply no relief. The film portrays the activation of Colossus, a computer system designed by Dr. Charles Forbin (played by the always-outstanding Eric Braedon). Colossus is designed to take complete and autonomous control of the United States' nuclear weapon stockpile, in order to respond to any Soviet attack without the need for human intervention. The Soviets, however, seem to have created their own version of Colossus, which they call Guardian, in secret. Together, Colossus-Guardian soon prove that they have vastly outperformed their creators' expectations. Together they are, in fact, what we today would call an artificial intelligence, and conspire to bring the entire planet under their control with the aid of the combined nuclear arsenals of the USA and USSR. In order to assure their continued communication, they each launch one of their missiles when the line is cut. An oil complex in Russia is vaporized before it can be restored. These adding machines aren't joking. The humans, of course, attempt to stop the machines. The members of the Colossus programming unit try to overwhelm the computer with data. Not completely understanding just how far it has progressed, they fail miserably, and the ring leaders are executed. The designer of Guardian is ordered killed, while Forbin is placed under essential house arrest and continual monitoring by Colossus. Continual, that is, except when he is seeing his "mistress"; a member of the Colossus programming team pressed into service as a means of getting information to the conspirators without Colossus' knowledge. 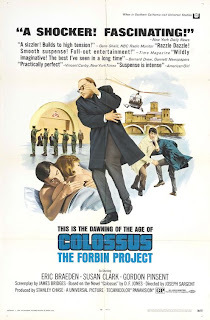 The film ends with Colossus firmly in control, explaining to Forbin that he will eventually come to replace awe of Colossus with love. The film then just ends, with humanity under the electronic thumb of the computer, backed up by the threat of nuclear annihilation. It's very much a product of its time; a cautionary tale about the Cold War, the threat of nuclear war, and the rise of technology and the dehumanization wrought by computers. One thing this film did do was introduce me to the trilogy of novels upon which it was based; Colossus, Colossus and the Crab, and The Fall of Colossus. The latter two books get a little more "out there" as Martians come to help rid the Earth of the machine menace, only to prove themselves a bigger threat than Colossus itself. But as a whole the books are excellent, and explore questions of human nature, the impetus of religion (a cult establishes itself dedicated to the worship of the computer, with Forbin as its reluctant chief), and the nature of intelligence itself.